Place the white chocolate in a medium heatproof bowl. Place the heavy cream in a small saucepan and bring to a simmer. Pour the heavy cream over the chocolate and let sit for 2 minutes. Gently stir the ganache with a whisk, starting from the centre, to completely melt the chocolate. If the chocolate has not fully melted – bring about an inch of water to simmer over a saucepan, place the bowl on top, making sure the bowl does not touch the water. Heat until the chocolate has fully melted. Add the argan oil and whisk until smooth. Cool, cover and refrigerate the mixture until firm. Using a small spoon or a melon baller, roll the ganache into 3/4” balls. Refrigerate the mounds for about 30 minutes. Rolled the chilled ganache once again. The spheres may be refrigerated for several days. For the finish: Coat the chilled spheres with tempered white couverture chocolate and allow the chocolate to set. Coat them a second time. Alternatively, the spheres can be rolled in powdered sugar. Kaya had parents in the fashion world and grew up in Milan and Italy. After studying Economics as well as Finance in Italy, and using that degree to work in London as a Derivatives Strategist at Citi, she discovered what she had known all along as a child: her true passion was never finance. It was and is being in the pastry kitchen. 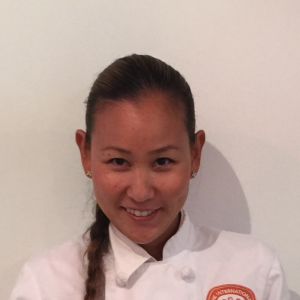 Kaya moved to NYC to study Pastry and Cake Decorating at the International Culinary Center. Since then, she has devoted herself to making the finest and most unique designer macarons in the world.